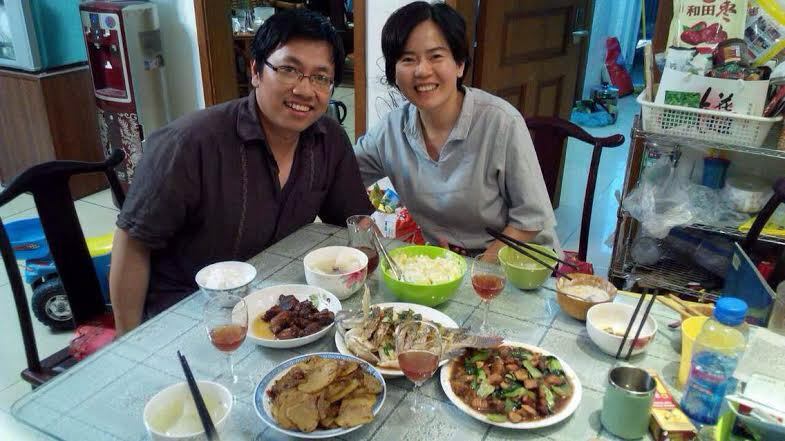 Eighty-six days after being taken from his Bejing home by police on suspicion of “picking quarrels and provoking troubles,” Guo Yushan is officially arrested and charged with “operating an illegal business”. Guo’s wife, Pan Haixia, posts her fourth letter to him online in his absence. Pan appears to have gained a sense of renewed fortitude from the endurance of others in similar situations, the support of friends and the online world that permits “people to express in solidarity with others”; an outlet that has also allowed Pan to share these extraordinary letters that will stand the test of time as part of her country’s historical record. Dear one, it took me longer to write this letter, but I have not stopped thinking about you, whether on the subway, before going to bed, or while walking alone. There are many things I want to say to you, but it’s getting harder and harder to put my feelings into words. To clarify one’s own thoughts and express them precisely in language, is not an easy task. I guess that’s why even those couples that love each other very much sometimes can’t avoid misunderstandings. Eighty-six days after being taken away from home on charge of “picking up quarrels,” you were officially arrested with “operating an illegal business” at last. I was inconsolable: a part of me had been hoping that you could come home soon. I thought that, if they realized that you had nothing to do with Lisha’s decision to print yellow umbrella posters in support of Occupy Central (although the invoice from the printer was made out to the Transition Institute, in reality, you and the Institute had nothing to do with it), you would have been freed. My heart was full of hope before Christmas, when Lisha, Chen Kun, Teacher Xu Xiao, Xue Ye, and Xiaoshu all got released. I was expecting you, Kaiping, and Xiao He to be freed soon as well. However, in the end I only received an official arrest notification. The butterfly effect doesn’t end with the returning home of the first butterfly, does it? Although I only received the official arrest notification on January 6th, towards the end of December my instinct had been telling me that something bad would happen. I couldn’t eat or sleep properly. The first thing I did after the New Year holiday was to deposit some money on your card in the detention center. Surprisingly, they told me that same day that you had made your first purchase inside the detention center, but the two times I asked before they said that no information about your purchases could be traced. This worried me a lot: what could this change possibly mean? On the morning of the 5th, the lawyer tried to visit you again and the officials only asked for more documents (rather than finding an excuse to deny the visits like before). I was wondering what had happened before the 4th … only later, when I received the official notification, did I realize that you were officially arrested on the 3rd. Guo and Pan in happier times. When one sends out strong signals, the universe will respond. I consider this gut feeling a grace from heaven. Otherwise, how could I have deposited money on the first day you were able to spend it? In your heart did you think, “Wow, what a wonderful wife”? Did it bring you satisfaction to think that I visit the detention center so frequently? Did you feel warm seeing my signature on the deposit note? Have I redeemed myself slightly for not giving you a hug on the night you were taken away? These silly questions filled my head on my way home from the detention center. Realizing that the worse has yet to come, my heart sank. You were not in good condition the first time the lawyer visited you. However, she told me that you seemed to have almost completely recovered the second time she saw you. I am happy that you could recover in such short time, but I can’t help worrying about what they did to you before that. Kaiping returned home on January 28th. After he was taken away without any legal procedure whatsoever, we were all very worried about his kidney problems and doubted that he would receive proper health care in the detention center’s hospital. Luckily, after a whole 110 incommunicado days, he came back to us. He is going to get a check-up in the next few days to see if his kidney problems have gotten any worse. The first time I saw him after he got back, we hugged each other for a long time and enjoyed a meal together. I didn’t ask him how he’s been in recent days – I don’t want to know, and he didn’t say. I sometimes imagine what it must be like for you in there, but I don’t dare to think too much because I know that the reality is often worse than what we can imagine. However, I sometimes think about it from another perspective: we are not the first, and we won’t be the last ones to go through this. If others have been able to bear it, we should be able to as well. So, let’s just hold on a little longer, my dear, just a little bit longer. Once all of this is over, things will go back to how they were before; we’ll continue to fight and live passionately. For more than a month now, I have been trying to exercise patience. However, a few questions have been bothering me, such as: where is the limit of my patience? Living in fear like this, where is my breaking point? When the first one disappeared, I was furious; when the second and third disappeared, I started to fear that I would be next; when no one else disappeared, I was relieved; when each one was freed, I was happy. But what is there to be happy about? Do innocent people deserve to undergo any of this? About when you could return: in the beginning I hoped it would be after 24 hours, then 37 days. Then I was hoping that you wouldn’t be formally arrested … and now what? How low should my expectations sink? I have thought a lot and come to terms with a shameful fact: I remember scolding them [the police – Translator’s note] from behind our door one midnight in 2006, but that me is gone. When you were taken away another midnight in 2014, I didn’t even have the courage to hug you. The innocent and fearless young woman has died, and what’s left is this scared middle-aged woman with few aspirations. I hate myself like this. Before the age of 29, I was living in a world of school textbooks and CCTV news, sincerely believing in everything they told me: the world is beautiful, the path is bright, people love each other; and that justice is on their side … I was brave in my ignorance, until you opened for me a window onto the realities of this world. Most people would mock me for this, but ridiculous as it might sound, it is my truth. Eight years ago, I experienced the destruction of the old world, but was never able to build a new one in its place. You criticized me for my disengagement, and you were right. All these years, I couldn’t bring myself to be enthusiastic about this ugly world. I couldn’t make peace with it, but I was also not brave enough to break with it. The shred of conscience that remained has only increased my feelings of helplessness. This is why, in recent years, I have become less and less interested in current affairs – I don’t want to see the miserable truth of the world too clearly. I don’t want to drown in helplessness and emptiness. Instead I just muddle along, hiding behind romantic love and domestic life. Therefore, you are my sanctuary, my soul’s refuge. You are a lover, a husband, and a teacher, a dear friend with whom I can talk about anything. You are also my child who will never grow up, the most precious, cherished person in my life. Our recent misfortune has finally made me reluctantly realize that the ugly despise the beautiful, and that the one I treasure most is also subject to abuse and humiliation. I can no longer sit on the fence: I must either make peace or break with the world. However, where do cowards like me find the strength to break with this ugly world? I always thought only the purest and the most beautiful will be cherished and remembered, no matter how fragile and powerless they seem – like those paintings of Jewish children in concentration camps. I hope I can also leave even a little bit of beauty to this world. Physical bodies are always a burden: they suffer from pain and hunger. Only by relying on spirit can we avoid becoming trapped in our bodies. Beautiful spirits can help us endure physical pain and gain a transcendent perspective on the era that we’re living through. Even if our resistance falters and breaks, it’s still valuable. Darling, be happy for me. Relying on this little wish (or vanity, or ambition, if you want to call it that), I have got past a critical juncture. At the end of December, I was summoned to the Preliminary Hearing Team of the Public Security Bureau for questioning. My first reaction was: will I be able to come home? I made a to-do list and put it into a folder with the other documents. I forced myself to appear calm while I told my parents what to do if I didn’t come back and bid goodbye to them. During the questioning, they said that some of the issues involved me and that they may need to investigate me further. For the following half a month, I was indeed scared. I constantly imagined how broken our lives could become, asked myself how much I could endure, prepared myself for suffering. By the end of it, however, I was relieved: we must come to terms with our true selves. If we deserve what we are enduring, this experience will only relieve us from future burdens and allow us to live more freely. If we are wronged, the world will judge us fairly in the end, and we will live with a clear conscience. You must know: speaking out about the truth is always meaningful. Darling, fundamentally, I haven’t changed: I am still a coward. I am constantly afraid of the misfortunes that might be awaiting us. But my little wish has helped me to carry on, despite my fear. Our brothers and sisters at the Transition Institute have gone through a lot and come out stronger on the other side. Can we call this a blessing in disguise? We must all work hard to make sure that we live up to this experience. On those days when I think so much that I give myself a headache and can’t sleep, I hope that this is just a fleeting dream, that I’ll wake up to discover that we’ve already journeyed together through a large part of our life. The two of us would be sitting side by side on a bench in the warm sunshine, telling stories of our youth to our grandchildren – but this is just a dream, a nap. “I fear that time passes too slowly. How I wish our hair could would turn gray overnight and that we will never be apart” – these lyrics are apt. You’ve only been away for 100 days, and I have already suffered so much. I’ve heard of people who were separated for longer. How did those wives endure it? They probably didn’t have as many friends as I do, and there was no Weibo or WeChat back then. Did they have anyone to share their pain and sorrow with? How lucky we are to receive so much support from friends, just because of those good deeds of yours. How lucky we are to be living in a connected age that allows people to express in solidarity with others. Therefore, to realize that little wish of mine, and to repay the good intentions of our friends and supporters, I have decided not to desire too much – desire to protect oneself, one’s family, one’s friends … People are such trivial beings, how can we have so many desires? It is more than enough to be able to protect one’s own body and heart. So, darling, when the worst comes, we should not scruple on account of each other. You are there, and I am here – let’s just take care of our own bodies and hearts. I am afraid you will have to spend Spring Festival behind bars this year. There are quite a few friends in there with you. Ridiculous as it may sound, I hope you guys might run into each other, say hi, and exchange some warmth with one another. Ah-Hua wrote on New Year’s Day: “There are so many irresistible external forces in this world. What’s comforting is that trust between friends and care between lovers can never be compromised”. I want to share these words with you. I hope you are comfortable and secure, physically and mentally. I love you and am awaiting your return. 1 Chen Kun, Xu Xiao, Xue Ye, and Xiaoshu (the nickname of Liu Jianshu) were taken into custody in the same wave of detentions that began with Lisha. Some believed that the detentions were triggered by Lisha’s printing of leaflets supporting the Occupy Central movement in Hong Kong and writing Transition Institute on the invoice. Subsequently, the Transition Institute itself became the target of police investigation, part of a broader wave of repression of intellectual freedom and civil society in the PRC. 2 Huang Kaiping, the executive director of Transition Institute; He Zhengjun, administrative director of Transition Institute. ; Huang and He were taken into custody shortly after Guo. Xia Lin was the defense lawyer of Guo Yushan and was taken into custody a month after Guo. 3 According to Pan’s first letter to Guo, she was so astonished by the arrest that she didn’t hug Guo before he was taken away from their house. 4 Thirty-seven days is the maximum amount of days that a detainee can be kept without an official charge, theoretically speaking. 5 China Central Television, the predominant state television broadcaster in mainland China. 6 Transition Institute is a civil society think tank that Guo has co-founded, whose major members have been either detained, questioned or forced into hiding since October 2014. 8 Weibo and WeChat are Chinese social media and messaging platforms. 9 Ah-Hua is the nickname of Ms. Li Jingrui, a Chinese writer and mutual friend of Guo Yushan and his lawyer Xia Lin. Read Pan Haixia’s first letter to Guo Yushan, dated October 14, here. Read Pan Haixia’s second letter to Guo Yushan, dated November 7, here. Read Pan Haixia’s third letter to Guo Yushan, dated December 3, here.